Ideas for your wedding ceremony music. . . These days the options for wedding ceremony music are endless. like incorporated into the ceremony and this is a great way to make your ceremony music more meaningful. The ceremony music can be a chance for your family heritage to play an important role - perhaps a favourite song of a loved family member who is no longer with us, especially if you are lighting a candle and taking a moment to think about people who can't be at your ceremony. A short verse or section of a piece of music they loved at this point can be very moving and a lovely way to include them in your ceremony. Many couples have a special song or piece of music that they would like incorporated into the ceremony - this can be a great option for the brides entrance. The following are a few ideas for the style & placement of music in your wedding ceremony. Remember - if you are wanting a live performance at your wedding it is best to book early! Usually about 15 - 30 minutes of instrumental music to set the mood. A mix of gentle, flowing music for your wedding guests to enjoy as they arrive. This is where you take centre-stage for your walk down the aisle. This is where you sign the legal documents for your wedding. This is the music played to mark the end of the ceremony. Often the music continues after the ceremony as your guests come and greet you as a newly married couple. Group and family photos usually happen straight after the ceremony while everyone is still nearby and your guests can enjoy being entertained while these are being taken. If you are having a modern wedding any of these songs will be perfect for your ceremony. 15 - 30 minutes of gentle instrumentals. 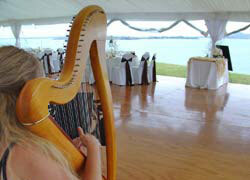 Harp will be an elegant addition to your traditional wedding ceremony with these pieces. Romance is in the air with these songs from well known Disney movies. 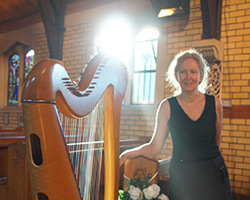 If you have Irish blood in the family you might choose to theme your ceremony with Irish music. Robyn's family hail from Scotland and England and she likes nothing better than to wear the family tartan strip at a Scottish wedding! Thank you so much for playing on our special day. The music couldn't have been more perfect and added a special magical touch to the whole ceremony. It is one of the aspects of our wedding day that has really stuck in both of our minds which we will remember forever. We have had so many people comment on how lovely your playing was, and we really enjoyed it too! Thank you again!